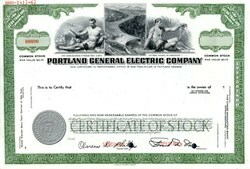 Beautiful engraved Specimen stock certificate from the Portland General Electric printed in 1967. This historic document was printed by American Bank Note Company and has an ornate border around it with a vignette of two allegorical men flankning a dam. Portland General Electric (PGE) (NYSE: POR) is an electrical utility, formerly owned by the Houston-based Enron Corporation (but now independent), that distributes electricity to customers in parts of Portland, Oregon, as well as parts of Multnomah, Clackamas, Marion, Yamhill, Washington, and Polk counties - half of the inhabitants of Oregon. The rest of the City of Portland is served by Pacific Power. In 2002, PGE reported revenues of almost $1.9 billion, and earnings of $66 million. Although PGE receives most of its electricity from the Bonneville Power Administration, it also produces its own power from a series of hydroelectric sites at dams on the Sandy, Clackamas, Willamette and Deschutes rivers, as well as a number of fossil fuel plants. Between 1976 and 1993, PGE operated Trojan, the only nuclear power plant in Oregon. PGE currently has 11 corporate officers, who include Peggy Y. Fowler (CEO and president), and James J. Piro (CFO, executive vice president, and treasurer). The utility was founded in 1888 by Parker F. Morey and Edward L. Eastham as Willamette Falls Electric Co. This corporation installed a hydroelectric generator at Willamette Falls to provide electricity to Portland. In the process, this corporation completed the first long-distance transmission line in the United States on June 3 of that year. Willamette Falls Electric changed its name several times before settling on Portland Electric Power in 1932. Portland Electric Power was reorganized as PGE in 1948. On July 1, 1997, Enron Corporation bought PGE for $2 billion in stock and $1.1 billion in assumed debt. Then in 1999, and again in 2001, Enron attempted to sell PGE to other investor-owned utilities. The corporate officers of PGE have claimed that this utility was not involved in the financial misdealings of its owner, pointing to the fact that many of its employees suffered when Enron froze the 401(k) retirement plan and were unable to sell the rapidly declining stock. However, John Forney, an energy trader who invented various electricity trading strategies such as the Death Star, operated from the trading floor in the PGE corporate offices. Concerned by uncertainty that the Enron bankruptcy would bring, several local governments began investigation of acquiring PGE by condemnation. These studies were ended following the announcement on November 17, 2003 that a group called Oregon Electric Utility, led by former governor Neil Goldschmidt and backed by Texas Pacific Group, offered to buy PGE for $2.35 billion. This was the sole bid received by the bankruptcy judge, who has approved the bid. When details that Goldschmidt had been sexually involved with a minor in the 1970s emerged, he withdrew from the negotiations, and was replaced by Peter Kohler, president of the Oregon Health and Science University. Many local groups voiced their suspicion that Oregon Electric Utility would be run to maximize profits short-term, rather than to the customers' benefits. These groups included Industrial Customers of Northwest Utilities, Associated Oregon Industries, the Citizen Utilities Board, as well as the majority of cities and local governments in PGE's service area. This purchase offer was denied by the Oregon Public Utilities Commission, a three-member regulatory board, on March 10, 2005. Discomfort over the Texas Pacific purchase led to a number of voter initiatives to convert parts of PGE into PUDs. PGE has so far defeated measures in Multnomah County (November 14, 2003), Yamhill County (March, 2004), and Clackamas County (May 18, 2004). PGE received notice of a strike by 900 union workers, effective March 8, 2004, represented by the International Brotherhood of Electrical Workers. Points over which the negotiations broke down include retiree medical benefits as well as losses in the members 401(k) plan. This labor dispute was shortly afterwards resolved, and the union agreed to a new contract. With the rejection of the Texas Pacific Group's offer, the City of Portland announced it contacted Enron to resume negotiating an offer to purchase PGE. On April 19, 2005, Portland city officials announced that they were willing to spend 7.5 million in attorneys' fees to purchase the utility. On July 6, the City Council unanimously adopted a measure to finance the acquisition of PGE by the sale of $3 billion in bonds. Enron interim CEO Stephen Cooper called off negotiations over acquisition of PGE on July 20, 2005. Cooper stated that he did not "see a plausible solution under which our teams could reach an agreement that would lead to a transaction closing in a timely fashion". Cooper addressed several causes for the termination, including the refusal of the city to pay a $50 million deposit on the sale. The same day, Governor Ted Kulongoski vetoed a bill that would create a public corporation to purchase PGE.